ITV has commissioned a one-off evening version of its breakfast show with Piers Morgan and Susanna Reid. Good Evening Britain will be broadcast at 9:15pm on Thursday 28th June, directly following ITV's coverage of England v Belgium in the FIFA World Cup. ITV promises "famous faces" who will drop by the studio at Television Centre, London, to offer their opinion on the match result and other news; Good Evening Britain will focus on all the controversial, amusing and memorable moments of of the night alongside the other news, current affairs and showbiz stories of the day. 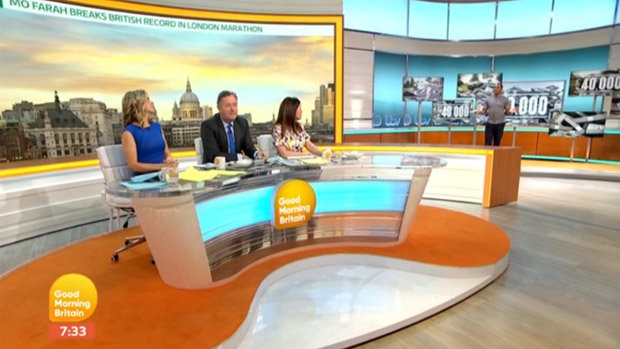 Back in March, the Mirror reported how Good Morning Britain presenter Kate Garraway wanted ITV bosses to consider an evening version of the show, albeit at teatime rather than timeslot scheduled for June's special show. It's not the only ITV morning show to make a switch to evenings: from this autumn, Robert Peston's Sunday morning show will relaunch as a Wednesday late night show, to be broadcast straight after News at Ten.